On behalf of its Malaysian shareholders, Battersea Power Station Development Company has awarded the Phase 2 piling works to Bauer Technologies, a subsidiary of the BAUER Group. 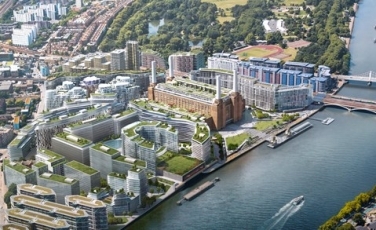 Phase 2 of the Battersea development involves the restoration and refurbishment of the power station itself to create more than 250 homes, 500,000 sq ft of commercial use, 350,000 of retail, a food hall set within 6 acres of new riverside park. The main contractor for Phase 2 of the development is Skanska. Developed by the Malaysian consortium comprising Sime Darby, S P Setia and Employees’ Provident Fund, the mixed use project will require Bauer to install over 600 no. bearing piles (diameters varying from 0.75m to 2.0m) up to 60m deep; (500 no. ‘dry’ piles and 100 no. piles under bentonite) together with 900 no. secant wall piles, all within the power station itself. Bauer mobilised to site at the end of February 2016 to commence the Advance Works that involves the installation of the preliminary test piles and piling works for 2 no. tower crane bases, followed by obstruction removal work in advance of the start of the main works in June 2016. Project challenges include the limited footprint available for heavy duty piling rigs and equipment, restricted access and, in places, restricted headroom when working around and under existing structures, removal of substantial manmade obstructions and the presence of a deep scour feature in the London Clay.